“Infraction! You made infraction. You cannot turn there.” Intimidating rifles fondled at the window. “Pay 400 pesos now or police station and 2400 pesos”…It is not hard to spot a tourist fresh from wintery UK. Welcome to Mexico! I will go to the police station… “We keep your licence. You pay, come back”. No, you might have to leave; I cannot leave my licence with you. It is not safe. Dodgy buddy on the phone with ‘better’ English – “You leave licence as COLLATERAL”. The 10 min impasse in broken English was finally ended when we remembered we had an advice document in Spanish and English provided by our car rental company. Get them to write you a ticket and send it to us. We will negotiate a 50% discount on your behalf and you can pay us when you return the car. Pure gold! So started our two-week adventure on the Yucatan peninsula. The objective was simple; escape the wintery cold of the UK to anywhere warm, sunny, with good beaches, some culture to explore and last but not least some fly fishing opportunities. Flights were pretty cheap too, although in hindsight we realised that this was due to a travel advisory due to a lot of drug related violence in Los Cabos and Cancun at the time. The Yucatan peninsula is a vast area with a lot to see and explore. We split the trip between Mayan runes and cities, exploring cenotes (stunning natural limestone sink holes with crystal clear water), time on the beach snorkelling and fly fishing around Majahual and Tulum. I will get on to the fishing soon, but cannot justify not sharing a small fraction of what else is on offer. We spent the first few days visiting cenotes and Chichen Itza, which is an incredible rune that really inspires the imagination as to what this civilisation looked like in its hey day. El Castillo is an amazing step pyramid within the complex of Mayan runes at Chichen Itza. You can easily spend the day navigating and exploring the huge array of runes. Colour and craft is everywhere in most areas that tourists frequent. One cannot help but picture this culture as colourful given the reliefs, patterns and decoration of the architecture. This is “La Iglesia” in the Las Monjas complex. From there a long drive on a seemingly endless straight strip of road, interspersed with random speed bumps, down to Calakmul. This is a vast rune of a city which is said to have housed over 55 000 inhabitants before everyone mysteriously disappeared. Calakmul offers are truly immersive experience as you walk around in the vast ancient city. This is one of the big pyramids that offer terrific views of the jungle from the top. To get to the runes you drive about 40 km into the jungle biosphere reserve and from the top of the major runes jungle stretches as far as the eye can see in all directions. The experience is truly immersive as you get to explore houses, temples and pyramids. 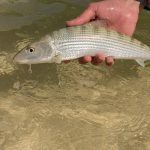 As this is a fishing blog, I will stop digressing but suffice to say the there is a huge amount to see and do if you are not fishing. Calakmul is superbly remote, but well worth the effort. Apparently the runes were spotted from an aeroplane, but were only explored 50 years later due to the inaccessibility. The fly fishing options are amazing for anyone who loves catching a variety of species. Plenty of lagoons filled with Tarpon, Snook, Jacks and other species. Then there are numerous of sand, coral and turtle grass flats in lagoons or along the coast. 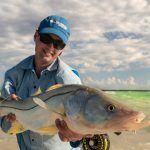 From what I can gather the fishing is pretty good year round depending on the target of choice and you can realistically target anything from permit, bonefish and tarpon to snook, jacks, barracuda and triggers. If you are heading in this direction, I would highly recommend the book “Fly-Fishing the Yucatan” by Rod Hamilton. It gives a wealth of information as a starting point for a DIY, or guided trip. The DIY fly fishing opportunities are excellent. My focus was very much along ocean side flats in search of bones, permit and triggers and hoped to find a few jacks and barracuda too. Next time I would like to explore the lagoons, but more on these later. Starting with the coast around Mahahual, you have 50+ km of beach interspersed with various flats and lagoons. I had spent numerous hours virtually exploring the coast on Google Earth mapping out GPS coordinates of flats, sand spits, interesting reef features, access points etc. This was also excellent for finding good snorkelling spots, where you can pin point various holes in the coral reef. The first day of fly fishing finally arrived! Having dreamed of this for months, tied hundreds of flies and spent many days of researching, anticipation had reached fever pitch. We headed to a mixed coral and turtle grass flat. Having never fished a coral flat before I did not know what to expect, but the thrill of exploration is surely the endless possibility without the burden of expectation. 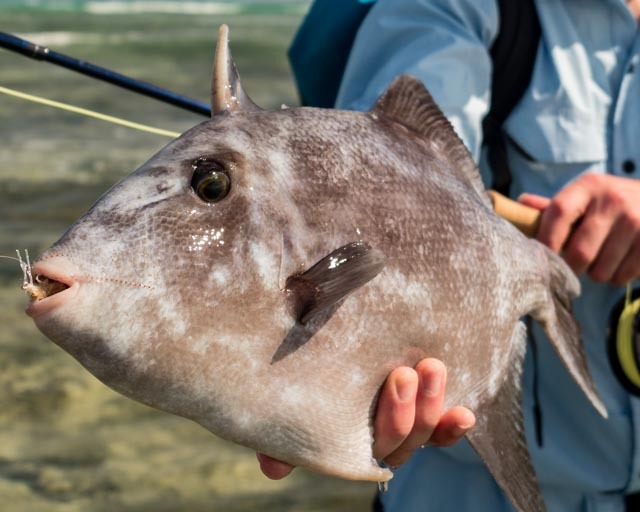 I rigged up and started slowly stalking the turtle grass margins hoping to come across a bone or permit, but after seeing nothing I moved up to a coral spit and came across a trigger frolicking in the clear greenish water about 20m away. Their rounded fins are unmistakeable and the dark colouring is hard to miss in the clear water. This was particularly useful when the wind picked up as it did every day. I placed a small tan kwan fly near its nose, which it nabbed immediately. Knowing their dirty fight reputation I pulled as hard as I dared, managing to hold it to a fairly small area. Sadly after a good tussle and with it almost defeated and thrashing on the surface, the hook popped out of its toothy mouth. While disappointed, almost immediately another black trigger shape floated into view with the rise of a wave a bit further out. I loved their relaxed attitude slowly tailing and frolicking about which gives plenty of time to get in position for a good cast fly fairly close to their nose. This trigger was hungry and so aggressive and proceeded to nibble, nip, chase and finally managed to chomp the fly almost at my rod tip. Happy times with my first fish from Mexico. As the tide moved in the triggers floated like dark shadows all over the reef in the background. These triggers pull hard, zipping around the coral, but contrary to what I expected they did not seem to play too dirty – or I was very lucky that there were no easily accessible holes nearby. I was having a ball with triggers appearing everywhere across the flat as the tide moved in. While trigger hunting, I was hoping to spot some permit tailing or moving over the flat. A couple small permit made an appearance surfing in the waves, always quite far away and moving very fast. Camo gear, rather than my luminescent blue cap might have helped. One long ‘Ball Park’ cast roughly in the direction of a travelling permit did result in a take and turned out to be a small hand sized permit. While not much it did put a smile on my face nonetheless as you never know what to expect in the tropics. My favourite trigger was feeding like a trout while sitting in a little hole about 2 feet wide while the surrounding flat was ankle deep at best. As waves retreated, the water would flow through and over the hole with Mr Trigger zipping back and forth feeding heavily. Casting ‘upstream’ and letting the fly drift into the hole immediately got a nibble, but not a hook up. Subsequent casts were eyeballed, but ultimately not eaten. Switching to an alphexo crab, almost resulted in success by the little tug again did not result in a hook up. As smart as any trout, it would ignore the fly on subsequent drifts. After about 20 minutes slowly working it over, I tried a small epoxy crab with a chartreuse hot spot and the trigger bolted like it had been shot. Grinning broadly I moved off looking for the next quarry. What is not to love about a good game of sight fishing chess? The triggers are ugly ducklings compared to their Indian Ocean cousins, but all the easier to spot on the flats especially as the wind picked up. Chartreuse consistently elicited the same panicked response and was benched after the third rocket off the flat. Alphlexos always raised a keen interest, but for some reason I could not get a hook up on them. Static, figure of eight, slow long strips, short sharp strips all got nibbles, but not a single hook up, even for a second. Perhaps they liked crab legs only. This one was staunchly patrolling and feeding in its coral bath just off the turtle grass near my elbow in the picture. The fly that performed the best was small size 4 tan kwan with pale grizzly rubber legs, which almost always got eaten, provided the fly was presented lightly nearby. I left the flat believing that these triggers were easy to target and very different to the temperamental antics of their Indian Ocean cousins. Wrong. Very Wrong. A couple of days later I drove past another flat and saw four good size triggers feeding merrily feeding. Rubbing my hands with glee at the prospect of a couple quick fish I was brought down to earth with a jolt. They ignored every fly in my box and were very skittish. If the fly plopped too much, had any chartreuse or flash they would scoot off at a rate of knots. And so, without so much as a nibble I was brought back down to earth to savour the challenge and the memory of the earlier trigger experience. While trigger happy, I was hoping to spot some permit tailing or moving over the flat. A couple of small permit surfed in the waves, always quite far away and moving very fast. One long ‘Ball Park’ cast roughly in the direction of a travelling permit did result in a take – a small hand sized permit. While it is not much it did put a smile on my face nonetheless. The wind started getting on my nerves and was making casting accurately to triggers a real pain and so I decided to head further up the coast to a good looking sand spit for some blind casting in the surf. Walking off the flat I was rewarded with another glimpse of the potential as an explosion erupted in front of me. I can still picture that big old bonefish giving me the eyeball as it rocketed out of there.